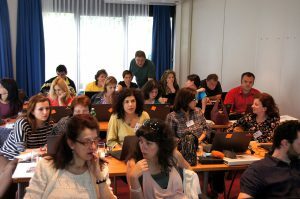 The EBI/EIE was member of th consortium in a Multilateral Project about Blended Learning. The focus was laid to quality enhancement in this project. The findings of this project will be the emphases of this course. The EIE (European Initiative for Education) is going to offer a special KA 1 Project in cooperation with the DigiLab of the university of Rome “La Sapienza” with the focus on “Creating Blended Learning Courses“. The core content of this project will be an In-Service Training course for teachers and trainers (formal as well as non-formal education) and university teachers. The project focuses on the creating of Blended Learning courses. These type of courses consist of several onsite teaching parts and additional technology enhanced distance courses. The In-service Training is a structured course (eligible for KA 1) and based on competency oriented learning. The offered training content is structured by competences. Be able to understand the concepts of Blended Learning. The course is structured in competence-oriented learning outcomes and offers a high level of practical assignments and best praxis examples. The preparation phase uses a distance learning platform to introduce theoretical knowledge to the participants. A final assessment is foreseen in the course and stated in the certificate of attendance, a EuroPass Moblility is available too. The project itself is run as a Blended Learning Course as an example of good practice. The preparation work will be done using the eLearning platforms of the EBI. There, the course materials are provided and most of the theoretical background knowledge is taught. The participants will be able to access them by entering their personal password. They should start thematic discussions in the web forum of the platform (with the help of a tutor). All participants will receive documents with basic definitions and descriptions for doing their preparation work. During the onsite lessons the participants work on the other topics, get assisted by tutors and finish the working program. The onsite teaching takes place in Rome at the DigiLab in modern computer labs. The course is finished by an assessment. Hint: If you have successfully applied for a KA 1 project grant and are interested in this course please contact the EBI/EIE! We offer a guided tour througt town, included in the course/subsistence fee. Background information: The EIE was member of the consortium of the Grundtvig Multilateral Project “Quality in Blended Learning“, that started in October 2013. The EIE as a responsible project partner uses the KA 1 projects for dissemination of the project’s results. So all Europeans can participate at the new gained knowledge bases on the research work and best praxis example of this project.